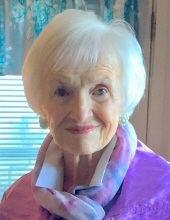 Margaret Lundwall, 93, of Fenton passed away on Sunday, March 17, 2019. Margaret was born in 1925 and grew up in Philadelphia, PA. While attending Nurse Cadet Corps training in Florida during World War II, she met a handsome young Naval Aviator named Clarence Lundwall at a U.S.O. dance. This was the beginning of a 72- year love story right out of the movies. They made their home in Michigan and lived in the Detroit area, Charlevoix, Curtis and Fenton. She enjoyed volunteering, golf, travelling, cooking and most of all, spending time with her children, close friends and adoring Grandchildren. Margaret will always be remembered as a kind, fun-loving person who made everyone feel special from the moment they met her. Margaret is survived by her 3 children: Colleen Lundwall (Robert Kellman), Diane Storves (William), Robert Lundwall (Elizabeth), 15 grandchildren: Heather Andrews (Thayer), Sean Kellman (Anina), Christopher Storves (Kathleen), Matthew Kellman (Hannah), Katherine Lundwall, Kelly Laimbeer (Eric), Robert Lundwall, Catherine McDonough (Matthew), Anna Lundwall, Sara Luberto, Eric Lundwall, Michelle Luberto, John Lundwall, Daniel Luberto, Michael Lundwall, 6 great-grandchildren: Cara, Benjamin, Grant, Cole, Marin, Emma, 3 sisters: Helen Simpson, Catherine Holmes, Joan Mulville, many cousins, nieces and nephews. She is preceded in death by her beloved husband of 71 years Clarence, her loving parents Michael (Sr.) and Catherine (Barrett) Cantwell and brother Michael Cantwell. A Funeral Mass will be celebrated at 11:00am on Saturday, March 30, 2019 at St. John the Evangelist Catholic Church, 600 N. Adelaide Street, Fenton, MI. 48430. Visitation begins at the church at 10:00am. Interment will take place on Monday, April 1, 2019 at The Great Lakes National Cemetery in Holly, MI.In lieu of flowers, donations can be made in Margaret’s honor to: The Fenton-Winegarden Library, 200 Ea. Caroline Street, Fenton, MI 48430. To send flowers or a remembrance gift to the family of Margaret Mary Lundwall, please visit our Tribute Store. "Email Address" would like to share the life celebration of Margaret Mary Lundwall. Click on the "link" to go to share a favorite memory or leave a condolence message for the family.